Our latest combo, the Diamond Creation Center from Martin Universal Design pairs a special edition Creation Station Table with our roomy Diamond Mobile Taboret for the ultimate home or studio workstation. The table has a maintenance-free white melamine top that measures a generous 23.5" x 40" with a 0-45 Degree tilt range. It measures 30.5" high in the flat position and includes a 23.5" metal pencil ledge/sheet stop to keep drawings and documents in place while the top is inclined. The sturdy 1.5" tubular steel base is coated in durable black enamel and has four multi-surface casters, two of which lock to secure position. 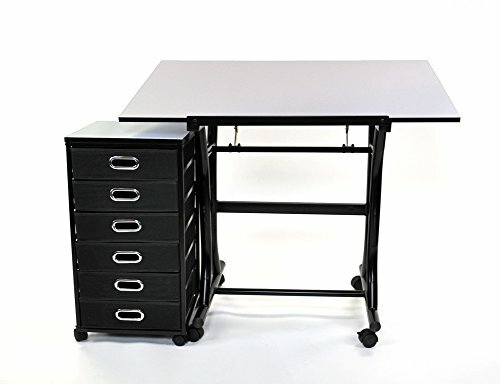 The Diamond Mobile Taboret has six spacious fabric drawers measuring 12.5"W x 12.5"D x 3.5"H each to store pads, tools and even scrapbook pages. The top is crafted of smooth, white melamine with PVC edging and is perfect for keeping active tools and materials at hand. It also has a sturdy metal frame, four easy-glide castors, two locking and a low 27" profile which will store easily under the table when not in use.